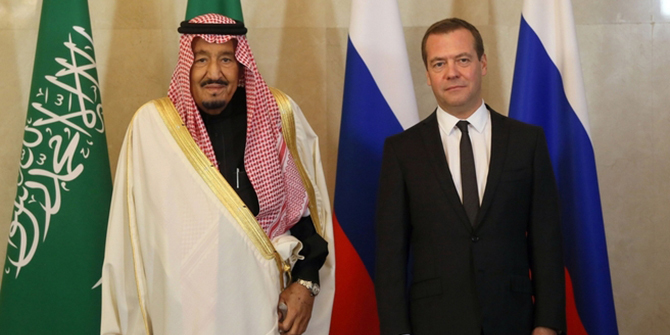 King Salman of Saudi Arabia meeting Russian Prime Minister Dmitry Medvedev. CC 4.0 kremlin.ru. Russia’s return to the Middle East has been characterised by the ambition to overturn the existing status quo in the region. Power projection in Syria has empowered Moscow to challenge the role of the US as a regional policeman in contexts where the White House chose to disengage as well as in contexts that are still critical to it. However, Russia’s Middle East policy, that is pragmatic yet confrontational in its nature, has been different in relation to the GCC. While Moscow has developed a view that the Middle East is a battleground against the West where it defends its national interests, this view doesn’t extend to the GCC. What makes the Gulf so different from the rest of the region is the rivalry between two strong powers, Iran and Saudi Arabia. Russia treads carefully when it approaches the Gulf and understands that a more active involvement in regional politics might make its relations uneasy not only with the GCC, but also with its partner Iran. When it comes to the Gulf, Russia also knows its limits: It recognises that the GCC remains firmly in the US sphere of influence, which doesn’t mean, however, that Russia cannot also explore opportunities there without challenging America’s standing with the Sunni monarchies of the Gulf. Long before Russia’s return to the Middle East in 2015, Moscow looked at the GCC as a region full of commercial opportunities. While Russia’s agenda for the Middle East is almost entirely focused on security, the GCC file is run by the Ministry of Economic Development, the Ministry of Industry and Trade as well as the Ministry of Energy. The Russian Direct Investment Fund that was established in 2011 became a one-stop shop for investors from that Gulf when Russia and the UAE’s Mubadala signed the first investment deal in 2013. Surprisingly, Russia’s position vis-a-vis the Sunni monarchies of the Gulf did not change as Moscow was getting dragged into the Syrian conflict and found itself aligned with Iran in support of Syrian President Assad. Despite disagreements on ways to settle the Syrian crisis that sometimes turned ugly with Russia and Saudi Arabia lashing out at each other, Moscow and the Sunni monarchies managed to compartmentalise their relationship. They agreed to separate the issues of Iran and Syria from their bilateral agenda, which arguably allowed both sides to benefit financially. While Russia’s interest in the GCC is quite evident given its growing isolation from Europe, the reason why the monarchies of the Gulf would see Russia as a trustworthy partner are much more complex. Moscow appears as a more consistent and reliable player that stands by its partners no matter what. This hit home in the GCC during Obama’s last days, whose disengagement in Middle Eastern affairs and empowerment of Iran incentivised the Sunni monarchies to look for an alternative guarantor of their security. Russia, with its geopolitical ambitions, was a new potential partner. But it is not only Moscow’s political clout that the monarchies of the Gulf are looking to capitalise on; Russia is still seen as a lucrative market for investors. While the Russian market bears considerable risks, it also provides high returns, which is why sovereign wealth funds from five of the six GCC states have signed investment agreements with the Russian governments. By reaching the 2017 deal on oil cuts with OPEC, Moscow demonstrated that its policy in the Middle East is not only about making Cold War era geopolitical gains, but remains highly pragmatic if its interests converge with those of the Gulf oil producing nations. Russia’s assertive policy towards the Middle East only amplified the necessity to develop a constructive relationship with Moscow. Over the past two years, Russia has seen a spike in royal visits to Moscow that resulted in dozens of investment agreements and energy deals signed. The most significant of them was the visit of Saudi King Salman to Moscow in October 2017. The significance of this royal visit is underpinned by the fact that it became the first visit of the Saudi monarch to Russia since the relations between Moscow and the third Saudi state, the Kingdom of Hejaz and Nejd, were first established in 1926. While this historic meeting was largely underwhelming in practical terms, it was hugely symbolic for both countries and symbolised a reboot of their relations. Both sides approached it with clear political goals: While Russia is looking to earn acceptance in the Arab streets by developing strong ties with the Saudi King, he in return saw his rapprochement with Russia as part of a plan to win backing for the ongoing transformation of the Kingdom and legitimise his son, Crown Prince Mohamed bin Salman, internationally as the future monarch. In this context the diplomatic crisis that erupted in the GCC in June 2017 caught Moscow off guard. Russia indicated its readiness to mediate this crisis and remained neutral despite the UAE Ambassador to Moscow’s statement about the possibility of ‘imposing conditions’ on GCC trade partners to choose between Qatar and the rest of the block. Surprisingly, Moscow found itself on the benefiting end of this crisis as both Doha and Riyadh attempted to rally Russia’s support and kept luring it with lucrative deals. A low simmering diplomatic conflict arguably works in Russia’s interest since it prevents the emergence of just one pole of power in the GCC and maintains a certain power balance there. What is worrying to Moscow in this regard is how adventurous and openly confrontational Saudi Arabia’s foreign policy has become. Mohammed bin Salman may be struggling to rein in Iran in Yemen but he has certainly set his mind to push back against Iran’s expansion in the Middle East. Riyadh may have disengaged in Syria but it has embarked on a more successful campaign to contain Iran’s influence in Iraq. Confrontation between the two will inevitably affect Russia’s Syria campaign and put Moscow in the spotlight as an enabler of Iran’s expansion. Yury Barmin is an expert at the Russian International Affairs Council covering the Middle East and North Africa, Moscow’s policy towards the region as well as the conflicts in Syria and Libya. He holds an MPhil in International Relations from the University of Cambridge. He tweets at @russia_mideast.